Apples are displayed for sale at the Apple Acres orchard, in Hiram, Oct. 26, 2018. New England apples are typically sold fresh and locally. The region's apples producers are likely to end the year slightly behind their average production of 3.5 million bushels. HIRAM, Maine — There have been a few bad apples, but New England’s crop of its signature fall fruit is only slightly behind last year’s. The U.S. Department of Agriculture predicted earlier this year the six-state region’s apple production would be in line with a typical year. That prediction appears close to the target, as producers are likely to end the year about 10 percent behind the average of 3.5 million bushels, said Russell Powell, a spokesman for the Hatfield, Massachusetts-based New England Apple Association. 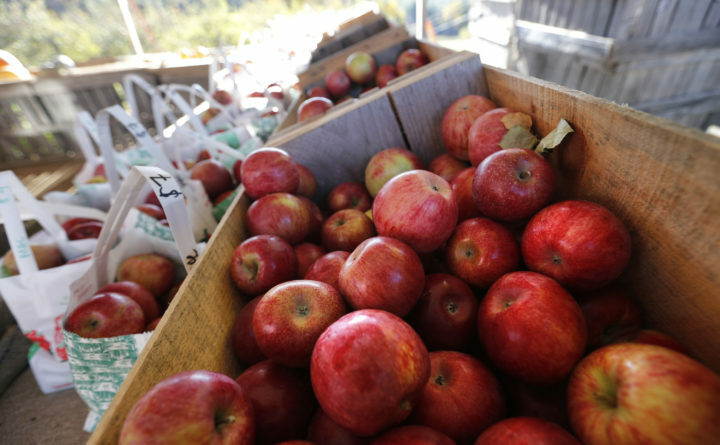 The New England states don’t produce nearly the same volume of apples as major players such as Washington and New York, but apple season is a major tourism draw in the region. The warm, early fall weather kept some people away from pick-your-own farms, but it was still a productive year at the orchards, Powell said. Parts of the region also struggled with drought, while others were pummeled by excessive rain. The squirrel population has also been booming, leading to pest woes on some orchards. And some growers struggled with apples that were smaller than normal. But the apple association said those factors didn’t stop many orchards from having productive years, with Maine and Massachusetts leading the way. Those are the largest apple-producing states in the region, and the USDA predicted before the start of the season that they would be about 10 percent ahead of 2017. That prediction seems to have held up, Powell said. New Hampshire was expected to have an average year, while Connecticut, Rhode Island and Vermont all appeared headed for slightly smaller crops, Powell said. It wasn’t an ideal growing season in Vermont, where parts of the state were in a drought this fall. A dry summer was followed by heavy rains in September and October that helped the apples grow, but also caused fruit to drop off trees and interrupted harvesting. In western Vermont at Champlain Orchards in Shoreham, the fruit wasn’t a uniform color at harvest time. That meant trees had to be harvested multiple times, said owner Bill Suhr. Despite the drought and heavy rains, the orchard is nearing its record harvest of last year, he said. New England apples are typically sold fresh and locally, Powell said. More than half the crop is sold through wholesale channels, utilizing mostly supermarkets. However, pick-your-own farms and orchard stores have grown in popularity since first appearing on the scene in the 1970s, Powell said. The USDA forecast Connecticut’s crop would fall from nearly 30 million pounds to about 16 million pounds, but business was steady at Beardsley’s Cider Mill & Orchard in Shelton, owner Dan Beardsley said. “I’m not complaining at all, and that’s unusual for a farmer,” he said. The apple season tends to end around Halloween in New England. But it’s still going at Appleland Orchard in Smithfield, Rhode Island, where owner Mary Lou D’Andrea said both the apple growth and the flow of customers have been steady. Associated Press writer Lisa Rathke contributed to this report.